 For more information about Bastiat’s life and work, as well as access to his works online, see <http://oll.libertyfund.org/person/25> and <http://davidmhart.com/FrenchClassicalLiberals/Bastiat/index.html>. A detailed chronology of his life (in French) can be found here "Chronologie de la vie et des oeuvres Frédéric Bastiat" by Jean-Claude Paul-Dejean at the Bastiat Circle website <http://bastiat.net/fr/biographie/chronologie.html>. A shorter one in English can be found here <http://davidmhart.com/FrenchClassicalLiberals/Bastiat/Lecture/Chronology.html>. An expanded one based upon Paul-Dejean’s (in English) here <http://davidmhart.com/FrenchClassicalLiberals/Bastiat/ExpandedChronology.html>. Draft Preface for the Harmonies [addressed to himself and written at the end of 1847. ], CW1, p. 318, 320. Online at <http://oll.libertyfund.org/title/2393/226010>. The Collected Works of Frédéric Bastiat. Vol. 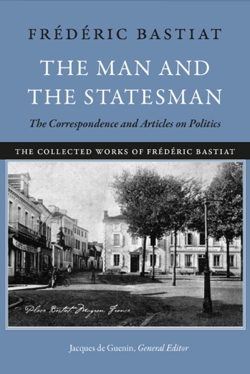 1 The Man and the Statesman: The Correspondence and Articles on Politics, ed. Jacques de Guenin et al. (Indianapolis: Liberty Fund, 2011). Online at <http://oll.libertyfund.org/title/2393>. Frédéric Bastiat, The Law, trans. Dean Russell (Irvington-on-Hudson, New York: The Foundation for Economic Education, 1974). Online at <http://oll.libertyfund.org/title/78>. 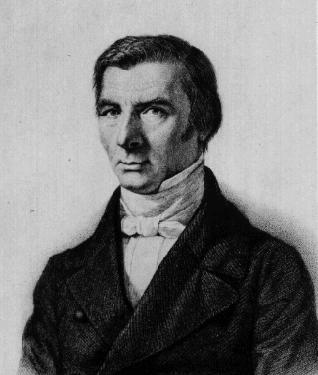 Frédéric Bastiat, Economic Harmonies, trans. W. Hayden Boyers, ed. George B. de Huszar (Irvington-on-Hudson, New York: The Foundation for Economic Education, 1979), online at <http://oll.libertyfund.org/title/79>; Economic Sophisms, trans. Arthur Goddard (Irvington-on-Hudson, New York: The Foundation for Economic Education, 1968), online at <http://oll.libertyfund.org/title/276>. ; Selected Essays on Political Economy, trans. Seymour Cain, ed. George B. de Huszar (Irvington-on-Hudson, New York: The Foundation for Economic Education, 1975), online at <http://oll.libertyfund.org/title/956>; Dean Russell, Frederic Bastiat: Ideas and Influence (Irvington-on-Hudson, New York: The Foundation for Economic Education, 1969). The glossary dealing with French and English political economy can be found online here <http://davidmhart.com/FrenchClassicalLiberals/Bastiat/Glossary.html>. This title is of course a play on words on the title of one of Bastiat’s best known pamphlets “The Seen and the Unseen” (or “What is Seen and What is not Seen”) (1850) in which he makes one of his cleverest and most sophisticated arguments concerning the nature of economic analysis, namely, the broken window fallacy. Online at <http://oll.libertyfund.org/title/956/35425>. “General Introduction” by Jacques de Guenin and Jean-Claude Paul-Dejean, pp. xxiii-xxvx. Online at <http://oll.libertyfund.org/title/2393/225564>. 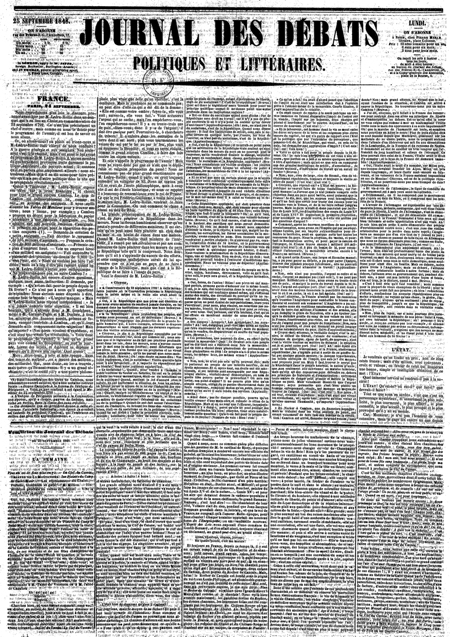 Bastiat, “De l’influence des tarifs français et anglais sur l’avenir des deux peuples,” Journal des économistes, August-November 1844, vol. 9, pp. 244-71. Online at <http://davidmhart.com/FrenchClassicalLiberals/Bastiat/JDE/BastiatTarifs-JDE-1844-T9-AugNov.pdf>. See the Introduction to the Correspondence by Dr. David M. Hart in CW1. Online at <http://oll.libertyfund.org/title/2393/225576>. Oeuvres complètes de Frédéric Bastiat, mises en ordre, revues et annotées d’après les manuscrits de l’auteur. Ed. Prosper Paillottet and biographical essay by Roger de Fontenay. (Paris: Guillaumin, 1st ed. 1854-55, 6 vols; 2nd ed. 1862-64, 7 vols; 3rd ed. 1870-73; 4th ed. 1878-79; 5th ed. 1881-84; 6th ed. 1907). Online at <http://davidmhart.com/FrenchClassicalLiberals/Bastiat/index.html#works>. 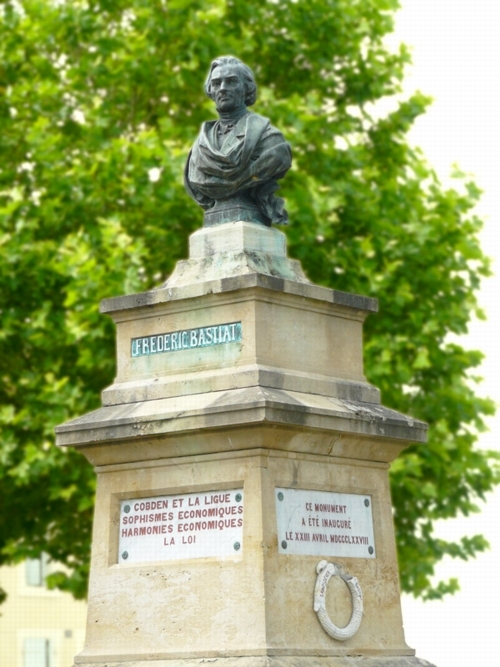 Frédéric Bastiat, Lettres d'un habitant des Landes (Paris: A. Quantin, 1877). Online at <http://davidmhart.com/FrenchClassicalLiberals/Bastiat/Books/Bastiat_Lettres1877.pdf>. Bastiat describes himself as one of the "cold economists" in a letter to Mme. 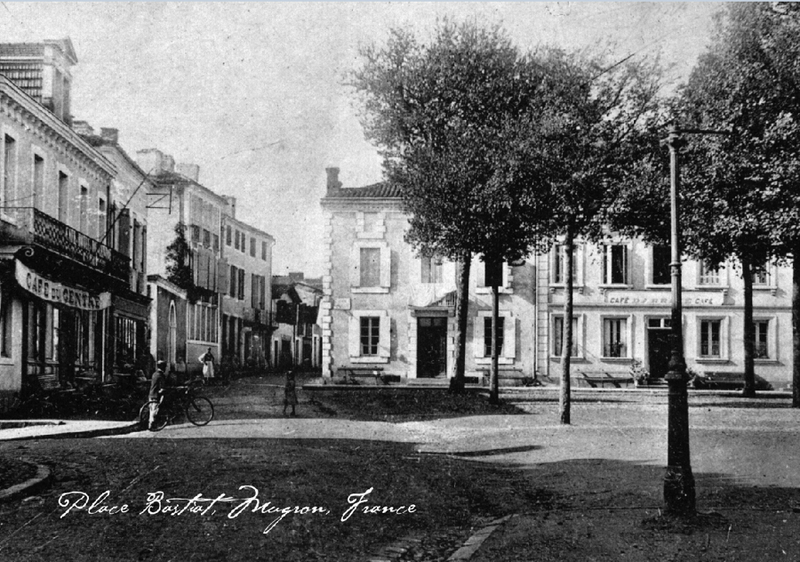 Cheuvreux in June 1850 (no. 174) <http://oll.libertyfund.org/title/2393/225927> and the Parisian Économistes as his "co-religionists" in another letter to Mme. Cheuvreux in March 1850 (no. 163) <http://oll.libertyfund.org/title/2393/225905>. 37. 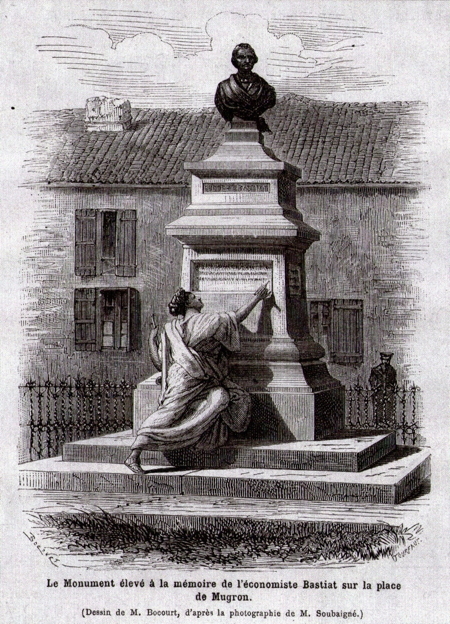 Letter to Félix Coudroy, Paris, May 1845. Online at <http://oll.libertyfund.org/title/2393/225653>. 2. To the Electors of the District of Saint-Sever, 1846 [363-5]. Online at <http://oll.libertyfund.org/title/2393/226020>. 186. Letter to Richard Cobden, Paris, 17 August 1850. Online at <http://oll.libertyfund.org/title/2393/225951>. For information about the Société d’économie politique (founded 1842) see <http://davidmhart.com/FrenchPolEc/SEP/index.html>. For information about Charles Comte (1782-1837) see <http://davidmhart.com/FrenchClassicalLiberals/Comte/Comte-BioBibliography.html> and Charles Dunoyer (1786-1862) see <http://davidmhart.com/FrenchClassicalLiberals/Dunoyer/Dunoyer-BioBibliography.html>. For information about Gustave de Molinari (1819-1912) see <http://davidmhart.com/FrenchClassicalLiberals/Molinari/index.html>. For a complete list of all 46 articles by Bastiat in the JDE see <http://davidmhart.com/FrenchClassicalLiberals/Bastiat/JDE/Bastiat_JDE.html>. 163. Letter to Mme Cheuvreux, Paris, March 1850. Online at <http://oll.libertyfund.org/title/2393/225905>. Lettres d’un habitant des Landes, Frédéric Bastiat, pp. 3-4. Online at <http://davidmhart.com/FrenchClassicalLiberals/Bastiat/Books/Bastiat_Lettres1877.pdf>. See his brief discussion of this in “The Physiology of Plunder” in Economic Sophisms, trans. Arthur Goddard (FEE,1996). Online at < http://oll.libertyfund.org/title/276/23376>. 196. Letter to Bernard Domenger, Pisa, 8 October 1850. Online at <http://oll.libertyfund.org/title/2393/225971>. 148. Letter to Mme Cheuvreux, Paris, 7 October 1849. Online at <http://oll.libertyfund.org/title/2393/225875>. 5. Letter to a Group of Supporters, 1849 [CW1, pp. 387 ff.]. Online at <http://oll.libertyfund.org/title/2393/226026>. 150. Letter to Mrs. Schwabe, Paris, 14 October 1849. Online at <http://oll.libertyfund.org/title/2393/225879>. 93. Letter to Marie-Julienne Badbedat (Mme Marsan), 27 February 1848. Online at <http://oll.libertyfund.org/title/2393/225765>. 94. Letter to Félix Coudroy, Paris, 29 February 1848. Online at <http://oll.libertyfund.org/title/2393/225767>. For information about Coquelin, Fonteyraud, Garnier and other French économistes see the glossary online at <http://davidmhart.com/FrenchClassicalLiberals/Bastiat/Glossary.html>. 104. Letter to Julie Marsan (Mme Affre), Paris, 29 June 1848. Online at <http://oll.libertyfund.org/title/2393/225787>. In a letter to Coudroy (no. 133, 235 April 1849) Bastiat notes that some English admirers think that there have been three schools of French political economy which have developed around the ideas of three leading theorists: Quesnay, Say, and now Bastiat. He agrees that he has had the original ideas to form a new school but has not had the time to fully form them. Online at <>http://oll.libertyfund.org/title/2393/225845>. Draft Preface for the Harmonies [addressed to himself and written at the end of 1847. ], CW1, p. 318, 320. <http://oll.libertyfund.org/title/2393/226010>. Originally published in the first issue of Jacques Bonhomme, dated 11-15 June 1848 [CW1, pp. 433-44]. Online at <http://oll.libertyfund.org/title/2393/226072>. Originally published in the first issue of Jacques Bonhomme, dated 11-15 June 1848 [CW1, pp. 434-45]. Online at <http://oll.libertyfund.org/title/2393/226074>.